Lately, I have been finding inspiration from vibrant colors found in nature! 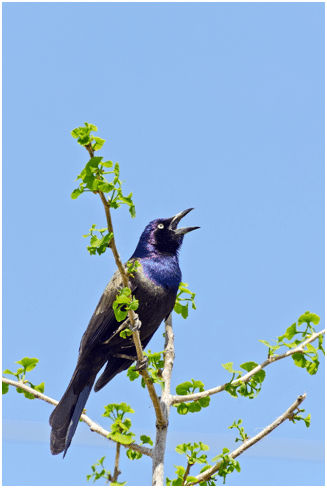 The dark rainbow of iridescent colors that slick across the feathers of blackbirds and grackles is my inspiration for this painting. I go through the process of making it step-by-step in this video. When I started pouring, I immediately transformed into a mad scientist! I spent hours watching videos and taking notes, and hours mixing and pouring paint in a free-wheeling, intuitive manner. I tried to follow the recipes I was learning, but I did not always want to take the time to get the actual brands of paint, pouring mediums, and other materials online instructors were using. I was on fire, craving the colors, the mess, and discovery… I wanted to pour! So, in the beginning, there were a ton of substitutions, and it was a three month period of experimentation. As time went on, I started getting more systematic. I measured, took notes, and eventually settled on a single brand of paint. Using a single brand of paint really helped. I got to know the paint and the perfect consistency that it needed to get the results I wanted. I have been using the recipe I explain in this video for a year now. While I love getting consistent results, I really miss the experimentation! Challenging myself with new color combinations helps keep the experimentation vibe flowing! 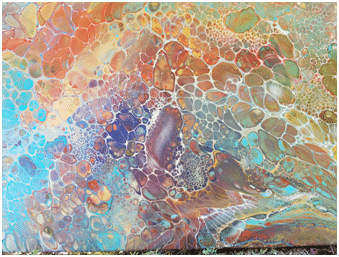 Here is a recent painting inspired by the colors in boulder opals! It was my first successful swipe! 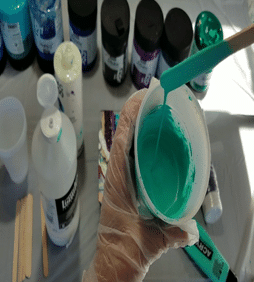 My recipe and process for mixing paint is pretty simple but it might not be for everyone. I use a kitchen scale and measure my ingredients for every color. Some folks might find that this stifles the creative flow, but I find it to be therapeutic and meditative. I have tried this recipe with Pebeo Studio Acrylics and Amsterdam paints. It is not appropriate for thinner paints and may need tweaking for other brands of paint. Before getting started I prepare a thinning solution by combining pouring medium and water in a 1:3 ratio. Using a kitchen scale, combine three parts paint and one part pouring medium. 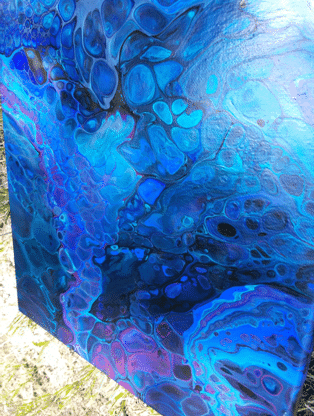 For pouring medium, I use half GAC 800 and half Liquitex pouring medium. 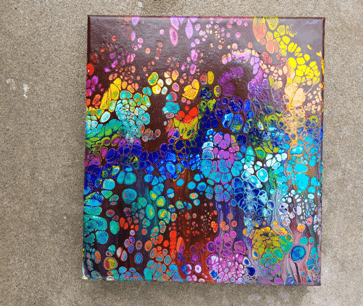 For example, if I use three ounces of paint, I will mix it with one ounce total of pouring medium (.5 ounces GAC 800 and .5 ounces of Liquitex pouring medium). Stir slowly and take your time to ensure it is fully combined. Next, add thinning solution and mix thoroughly until the paint is the correct pouring consistency. My paint mixture is relatively thick. Paint consistency is key and difficult to describe. I would call it “warm honey” but warm honey exists on a continuum so that description can be misinterpreted! Soap makers classify the consistency of a mixture according to its trace. They evaluate a mixture’s readiness (thin trace, medium trace, thick trace) based on the trailings it leaves on the surface when drizzled from a couple of inches. I also look at trailings to evaluate consistency. I discuss this and what I look for a bit in this video and try to give a visual. Some of my previous videos have a bit clearer visual on the thickness. To keep air bubbles at a minimum, I usually cover and let the thinned paints sit for eight or more hours to let the air bubbles dissipate. 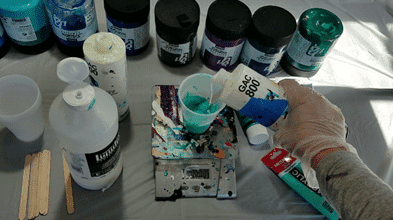 Immediately prior to pouring, add 1 drop of treadmill silicone oil to each ounce of prepared paint (eg. Add 12 drops oil to 12 ounces of red, six drops to six ounces of blue, etc.). Stir gently prior to filling the flip cups. After adding silicone to each color, begin filling the flip cup. Gentle layering will help keep the colors more distinct. Throughout the process I will occasionally pour a color from higher up so that it goes deeper and mixes the other colors just a bit. I try to alternate between transparent and opaque colors. This may or may not help with cells, but I figure it can’t hurt! Be sure to use enough paint! You will lose cells if you have to tilt the canvas too much, and too much tilting can cause colors to mix and become “muddy.” Speaking of muddy, I learned the actual art-word for that is desaturated, and a mix of saturated and desaturated colors is actually a good thing in terms of color balance and harmony. 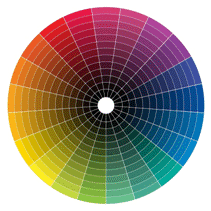 You will get desaturated colors by mixing colors opposite from each other on the color wheel (complementary colors). Not all combos of saturated and desaturated colors will make the eyes happy, but it is something for experimentation! 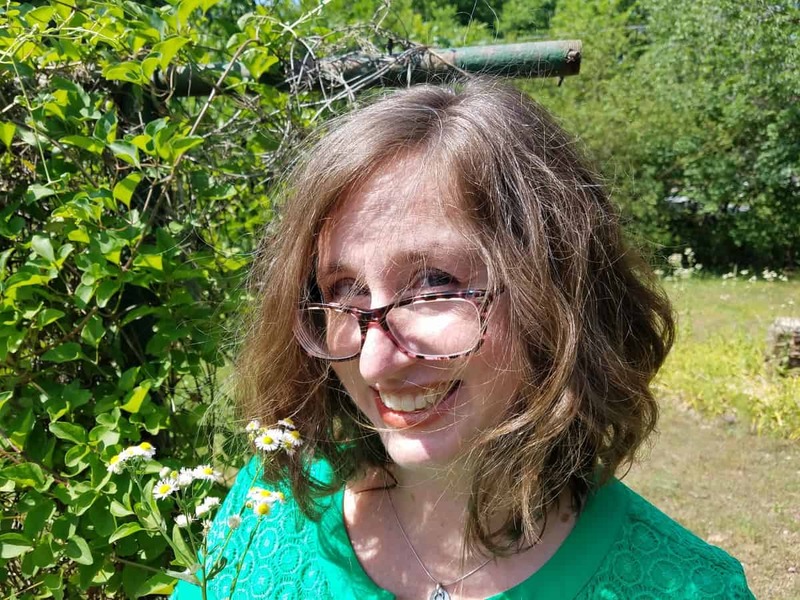 Check out Sara Wagner’s introduction to color theory! I also recommend Scott Naismith’s color theory videos! He has helped me so much! Even though I am learning, my color ideas don’t always work out. Test pours have become an important part of my process. Before any large painting, I do a small test with the colors I have chosen. This allows me to eliminate problems and identify colors that react well when placed together. As you will see in this video and others, I do a ton of torching. I keep the torch at a good distance (six to eight inches away) and move it quickly so that I am slowly warming the paint. My mixture is thick, so it takes a while for the paint to get warm. Once it gets warmed up cells begin to appear. I torch at two times (pre-tilt and post-tilt) to get a mix of large and small cells. I have learned it is important to dry the painting slowly and to protect it from too much air flow. The only time my paintings have cracked is when I have allowed them to dry without a cover. For most of my paintings, I use large tupperware as a cover. I elevate one corner to allow for a bit of air flow but keep it mostly closed to retain humidity as the moisture evaporates from the paint. This painting was a lot of fun! While it is a much darker color palette than I would normally choose, the end result does remind me of blackbird feathers! 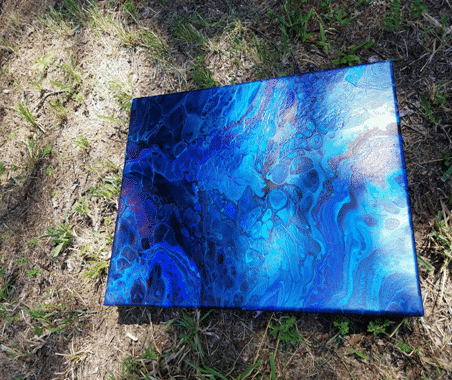 Finding color inspiration—and learning about color—has helped get me out of my comfort zone and has reinjected my pouring with the excitement of discovery and experimentation! Very good article! Complete and concise. Thank you! Thank you, Dianne! I was trying really hard not to go off on too many tangents 🙂 It is HARD to do because I am a jabberjaw on the camera. Thank you very much for the feedback!